Mention Sossousvlei and many people picture red or golden sand dunes at sunrise. 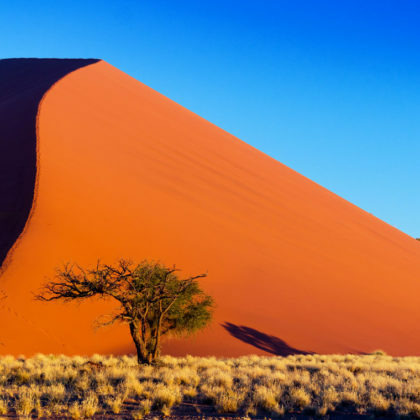 This area of the Namib-Naukluft National Park is known for its high sand dunes ranging from pale apricot to brick orange and deep red, contrast vividly with the dazzling white surfaces of the large clay pans at some of their bases. 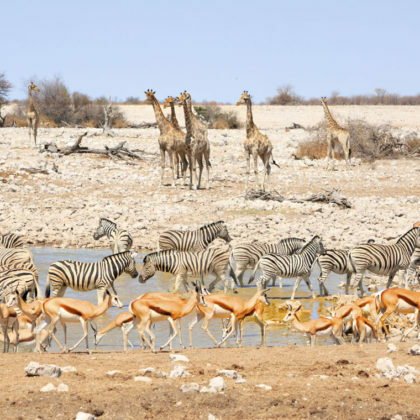 The Etosha National Park is considered by many to be one of Africa’s best game reserves. It is one of Africa’s biggest conservation areas and is named after the vast dried up salt pan contained within its borders. These waterholes are great places to sit quietly with your camera and capture some of the most atmospheric safari shots anywhere on the planet. The Himba are pastoralists who still practice an ancient and traditional way of life. 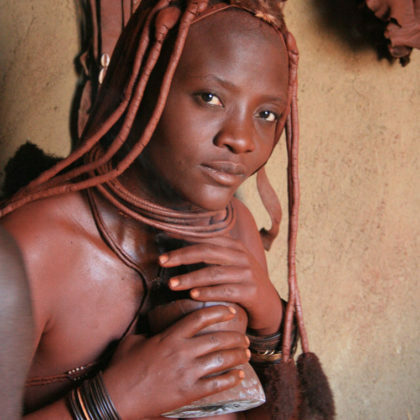 The Himba women are known to be tall and statuesque with intricate hairstyles and beautiful traditional jewellery. The Himba women rub their bodies with a mixture of red ochre and animal fat to protect themselves against the harsh sunlight of the desert climate. 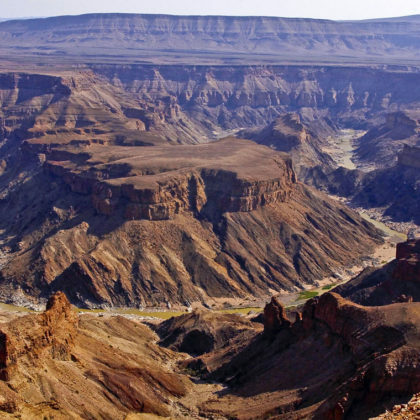 Namibia’s answer to the Grand Canyon is the Great Fish River Canyon. It is the largest canyon in the southern hemisphere, and probably only second to Arizona’s Grand Canyon in terms of size. Hiking is a popular activity in the area and there are many view points from which to admire the vistas. Bavaria in the desert by the sea? Perhaps an apt description for this coastal town which has a strong German influence. The town is known for its architecture and adventure activities such as sandboarding and wind surfing. 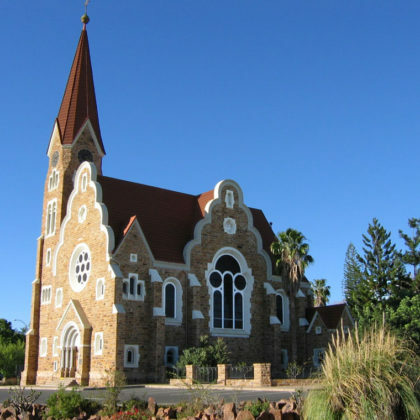 Namibia’s capital city, Windhoek is characterised by a proliferation of German style buildings, remnants if the country’s colonial history. Early buildings such as the Alte Feste (old fort), Christuskirche and Tintenpalast (the parliament buildings) are of particular interest. The city is home to Namibia’s brewing industry so be sure to enjoy a cold beer while you are there. 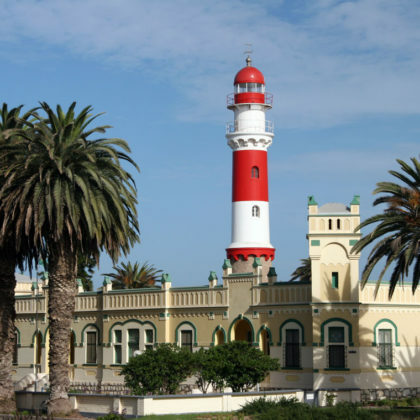 Walvis Bay which means whale bay was once an important whaling port. Today, cruises to see whales and dolphins are popular. 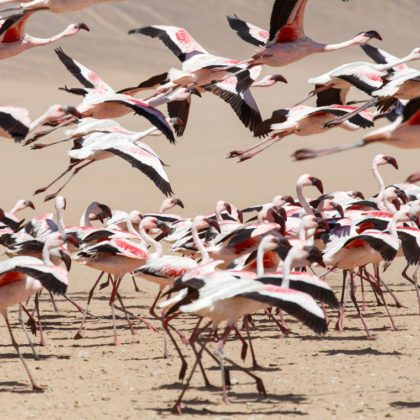 Nearby, there is an impressive seal colony at Cape Cross and the area is also known for its flocks of pink flamingos.